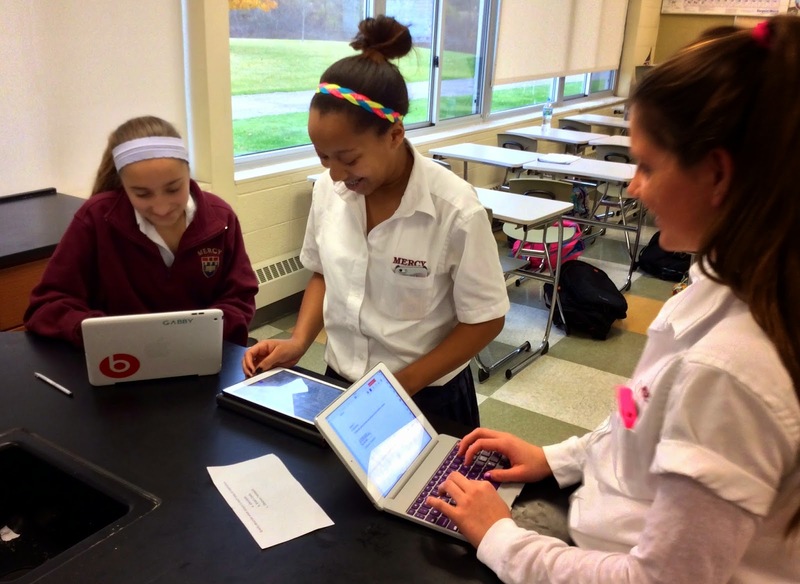 In Ms. Riley’s biology class the students reviewed for a test by going to lab stations. They used iAnnotate PDF to write notes on their digital worksheets. They also accessed their iBooks for information. Ms. Harris-Schultheis’s class had recently visited the Holocaust Memorial Center. When I stopped by the girls were listening to a Camp Survivor anthem accompanied by visuals. The students accessed the lyrics on their iPads through Schoology. 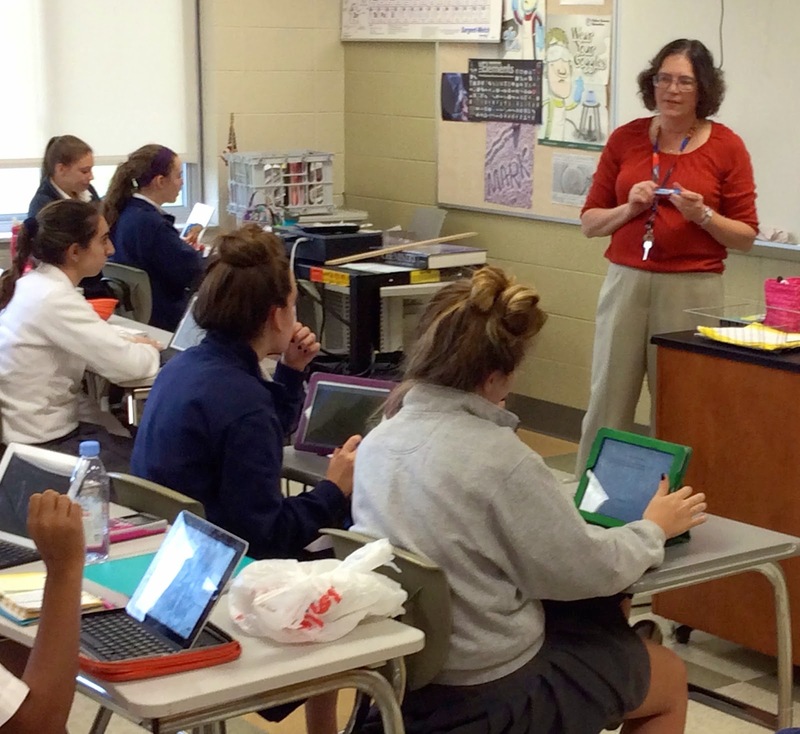 In Ms. McGavin’s anatomy class I observed juniors using the iPad and seniors using the HP Tablet. The students used their devices to access diagrams, highlight key items and take notes about the human jaw. As you can see in the foreground a student is holding a skull. Ms. McGavin was also projecting the images and notes through her Apple TV. So the students had many different ways to access and add to the information. 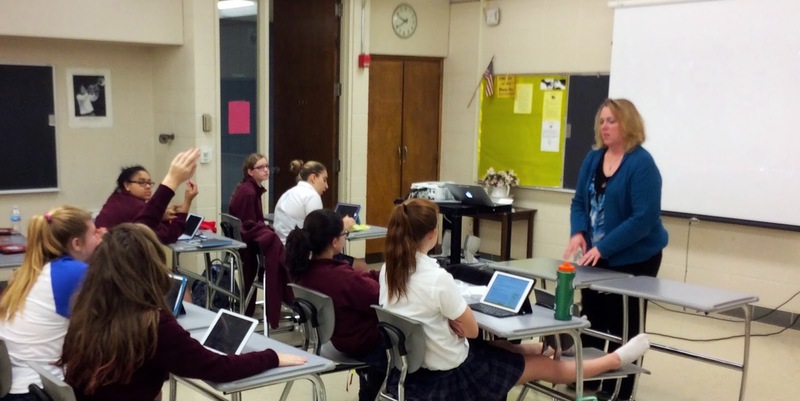 Ms. Hallie Smith’s ninth grade English class was also studying the Holocaust. Via an Apple TV they watched a YouTube of Hitler giving a speech, and then discussed it after looking up additional information using the Safari browsers of their iPads. 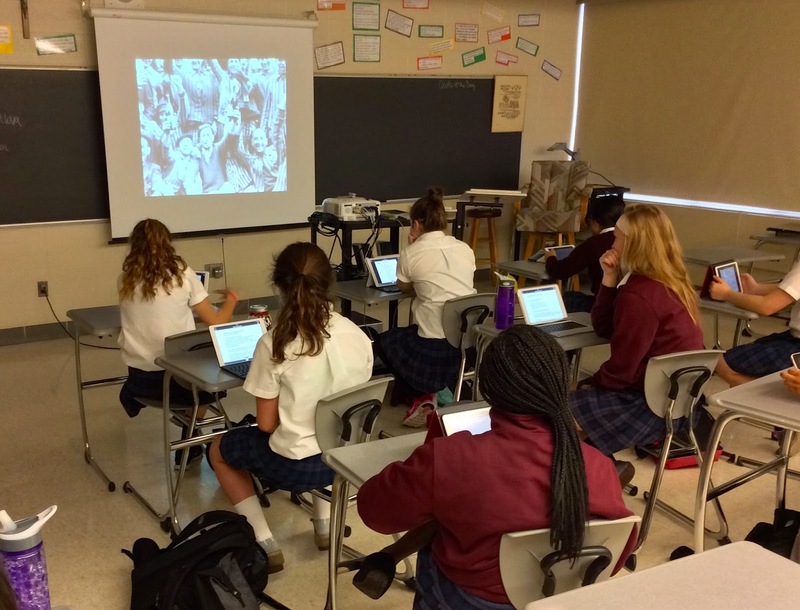 In Ms.Waldsmith’s Women in Literature class the girls (like the student in the foreground) supported their discussion with digital resources accessed through their devices. I was surprised that most girls preferred a paper rather than digital version of their novel, but most girls took notes on their iPads. 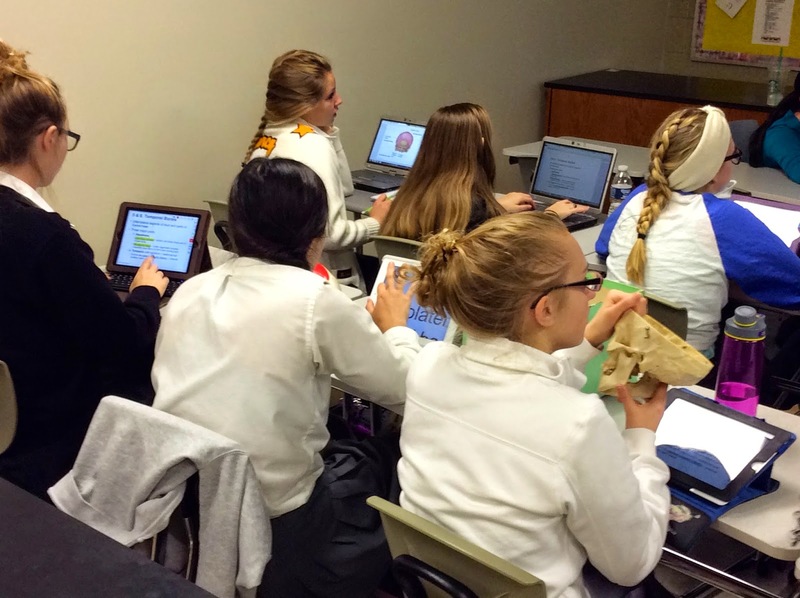 During Ms. Schrimscher’s chapter review (chemistry), many girls took notes with their iPads using Pages. 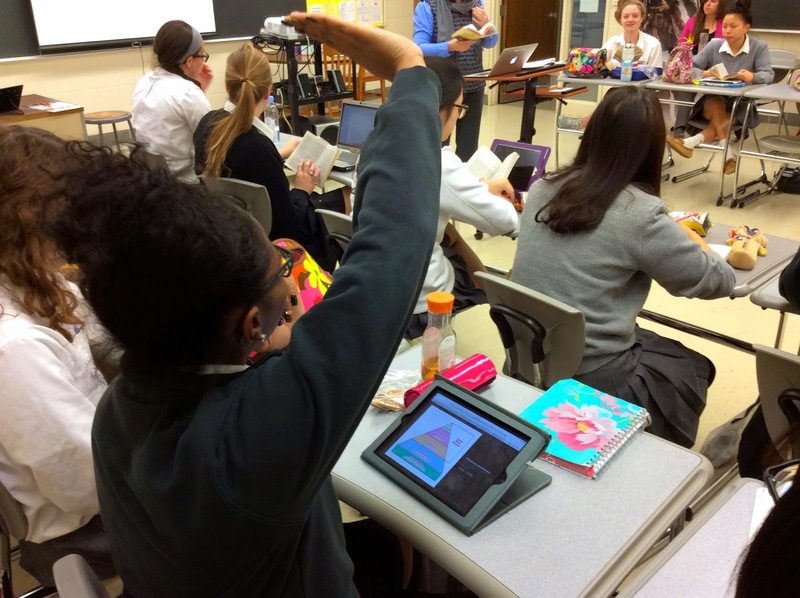 Students had reviewed digital resources before class, including a video that they could review through Schoology.